"As well as I may be, I am mightly careless. An old wound, not a new, seems to have slight bloodshed," He said, standing up, with an arm over his chest. He looked at his hand, that was his fault so he wasn't concerned about it. He had cut his hand several times in the same place for numerous reasons on various occasions, "Is everyone else fairing well?" He asked, holding concern for the youths whom had fought at his side. "A little tired, but just fine." She looked around. "But why'd they quit so easily? I mean, they just ran away. They could've beaten us for sure." Demyx's cheeks burned fiercely at Saix's whispered repremand. "Uh-uhmm...right. Sorry." He said softly, removing his hands from the blunette's face hesitantly. The Nocturne, having heard Xemnas' comment, turned toward the man and asked,"If you did kill him, wouldn't everything we've done so far be pointless?" 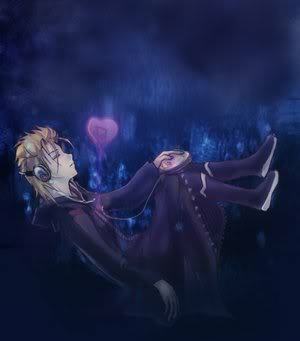 Xemnas sighed, 'feeling' as if he was talking to a child, "Yes Demyx, I know that's why I had us retreat. I was going to kill the sword-wielder, we'll need his heart, so I retreated, we can just swarm them with heartless later." Saix smiled, "That sounds like a fine idea Sir, would you like me to send my Berserkers along as well?" Xemnas smirked, "Yes, send them all the heartless and the Berserkers, we will have their hearts yet!" "To complete a different stragedy. I'm postive they will return with a different plan and possibly reneforcements," he said, "I have this knowledge due to several years of war experiance." "So what do we do?" Sora asked, crossing his arms to think. Kairi thought for a moment. "Well, we could go find the Keyhole and lock it, so they can't bring in Heartless reinforcements at the very least. If they want to turn Eliwood into a Nobody, they'd need a Heartless to take his heart, and if they can't bring anymore into the world, then they'd probably just give up and move on." Sora grinned. "Great idea! But where do we find the Keyhole...?" He frowned, but instead of thinking himself, he turned to Eliwood. "Hey, there aren't any hidden places people aren't normally allowed to go, are there? Or a place that looks like it has a puzzle that's impossible to solve? Or anything? We need to find the most important place around here." "I cannot tell you the location of the temple, for that would break my promise. But I can lead you there." "That sounds exactly like what we're looking for!" He grinned. "Thanks, Eliwood! Please! Get us there ASAP!" "A sap? I do not understand your terminology, but I'll gladly lead you there," He said as he mounted his horse, he reached an arm down to Sora, "You two are quite young, so I'm sure my horse will be able to hold us all, let us make haste." Sora nodded and climbed up after Eliwood. He helped Kairi up after him. "Let's get going." There were stopped by a swarm of Shadow heartless and Saix's Berserker nobodies. They shifted and geared up for battle, outnumbering the others 10 to 1. A couple of dusks perched themselves nearby to watch the battle and monitor progress, if needed they would call for Xemnas' Sorceror nobodies. Kairi whipped out her Keyblade and blasted with a Mega Flare spell, torching a path through the Heartless and Nobodies. "Just ride! We can out run them easy!" "Hold your hats lady and gentlemen," He said as he increased the speed at which they were going. They were fast approaching a cliff, where they had to jump pretty far to get across. They got that far, and the horse, without hestiation, leaped across it, landing on the next platform that was a little farther down. Kairi let out a small cry of fright and burried her face in the horse's mane--she was at the front of the saddle. She'd always loved horses, but she always hated hard riding. In fact, she didn't like horseback righting in general, despite having learned to ride when she was little. "You okay, Kairi?" Sora, on the other hand, had never been on a horse before and was loving the rush the hard riding brought with it. When she nodded bleakly, he asked, "We almost there, Eliwood?" "Yes, indeed we are. Keep your heads down." He said, so the speed increased, then, he lead the horse to jump straight into the lava pit. However, the lava pit was actually an illusion, they appeared on the other side, which was green and scared. It had a very old looking temple, with a lock on the door. "Great." Sora hopped down from the horse and walked up to the temple door. "This lock'll be no problem at all." He drew his Keyblade and pointed it at the lock. A light flashed at the tip of the key, and the lock fell away. Grinning, he pushed open the door. "So what should we be looking for?" Sora mused aloud. Kairi was grateful to at last be off the horse. She took a moment to catch her breath after the terrifying ride, and then followed Sora inside. "I don't know, Sora. What are we looking for? You're the one who found all the others. Not me." "Right. It must be deeper inside." Keyholes were never this easy to get to. Their path was suddenly blocked by a magical barrier and one of Xemnas' Sorceror nobodies hovered in front of it. Unlike the other lesser nobodies, the Sorceror had a full arsenal of magic and could cure itself. It was also quite intelligent, probably more so than Sora. "Aw man, not more of these freaks." Sora drew his Keyblade, as did Kairi. "Guess we'll just have to knock 'em all down before the barrier'll disappear." He charged, smashing one Nobody after another. 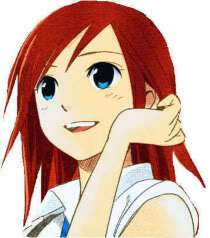 Kairi stood back and concentrated on healing. Her magic seemed to do little against the Nobodies, and so revival was her best option. 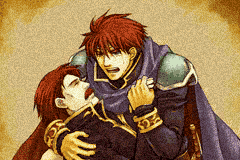 "Eliwood, help Sora." "Right," He said, he took down quite a few, but one managed to land a hit on a wound that he had gotten earlier that week. He cringed, getting down on one knee, holding his bleeding side, "How unfornate..." He muttered underneath is breath. 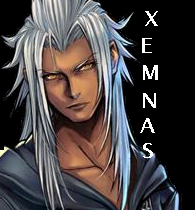 Xemnas smirked as the dusks relayed the scene of the fight to him, "Oh I see, they think we're after the keyholes. How assuming. It seems our friend the swordsman is injured, Saix kidnap the Princess of Heart again and Demyx make sure your dancers finish the swordsman off with heartless, we need that heart." Saix nodded, disappearing and reappearing behind Kairi, he lifted up the Claymore in an attempt to knock her out. The Sorcerors surrounded Sora, making him unable to escape their circle. Sora cursed to himself as the Sorcerors surrounded. 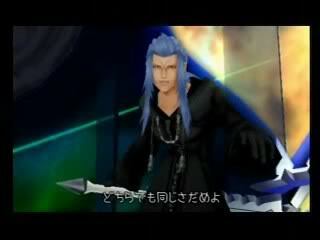 Then he saw Saix behind Kairi. "Kairi! Look out!" Kairi was in the middle of a cure spell for Eliwood and so couldn't move. The claymore came down hard on her shoulder. The blinding pain knocked her unconcious. Saix smirked to himself, throwing her body over his shoulder and disappearing. Sora smashed his way through the sorcerers and slashed at Saix just as he disappeared, his Keyblade cutting through the darkness of the portal just as it was closing. "Kairi!" he shouted. Enraged, he turned on the Nobodies that remained and blasted them all with spells and special attacks, wiping them all out.